Now that Felipe Massa has appeared at the top of the Drivers Championship table, it would be a good moment to consider where he fits in relative to his peers. He has been a revelation to many over the last eighteen months or so and Martin Brundle has declared him to be the dark horse for the title this year. 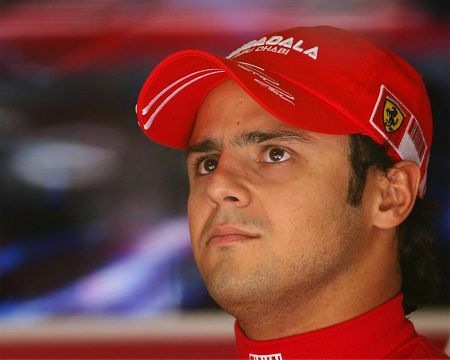 Brazilian Massa, 27, who drives for Ferrari, "made major errors" at the start of the season. But "on his day Massa is immense", Brundle added. "We saw him deliver his almost customary victories at Bahrain and Turkey, but it was generally accepted that over the course of the season Raikkonen would be the one to put in the critical fast laps around the pit-stop window, get to the front and control the race. "Yet Massa has apparently upped his game yet further this year." That is pretty much the general opinion on Massa at this stage - Martin is effectively saying what we already know, that Massa did not look great at the beginning of the season but has come good since then. It does not help me in my quest to understand why most of us have doubts about his ability to become champion. Is it that he somehow does not look the part, with his cherubic face and disgruntled expression? Or is it the number of mistakes he makes along the way? I am unconvinced by the first explanation, believing that champions look like champions once they have achieved the deed, and the second is unfair to say the least, considering that the other contenders (except Kubica) have made just as many mistakes this season. So why do we still consider him a dark horse, an outsider who just might steal the title at the last? I think it is time for a little heresy here; I make this suggestion purely as conjecture and knowing that it flies in the face of received wisdom. Is it possible that the Ferrari is a much better car than we suspect and that both of its drivers are less able than we believe? I have said before that my faith in Kimi Raikkonen is severely shaken and this would explain why he has been unable to assert himself as number one in the Ferrari camp. But that applies to Massa as well - if Kimi cannot subdue him, neither can the Brazilian put his superiority beyond doubt. It begins to look like a struggle between equals, Massa generally quicker in testing and qualifying, Raikkonen usually with the edge in actual racing. When we look back to Michael Schumacher's time at Ferrari, it becomes clear that, had he stayed on when Kimi arrived, the anticipated battle between greats would have turned out to be no contest at all and Michael would have added a few more titles to his tally. Yes, I know all the usual arguments about Michael having the team in his pocket but the fact remains that he was an outstanding driver, undoubtedly one of the best of his era. He taught Massa a lot, probably enough to ensure that Raikkonen's life would not be easy, but he was always the quicker driver. Our conclusion must be surely that he would have seen Kimi off too. There is a strong possibility, therefore, that Ferrari do not have the best drivers at the moment. I am no Alonso fan but am pretty sure that, given a Ferrari, he would be champion this season; and the same might apply to younger drivers like Hamilton and Kubica. Kimi scraped through to the championship last year on the mistakes of others and we all felt that he deserved it - but only thanks to his many years of gutsy performances in a McLaren that was rarely the best car. The theory fits the circumstances rather well, I think, and explains our doubts regarding Massa's real abilities. He is quick on his day, yes, but the lurking suspicion in the back of our minds must be that Alonso would be quicker all the time. That Spanish guy has proved over and over again that he can get a second rate car up amongst the best; now that Hamilton is falling out of favor, we begin to see Alonso's performance last year in a rather different light, giving more credit to his work with the engineers than we did before. In a Ferrari, he would be unbeatable. So perhaps we are right to doubt Massa, although I think we should include Kimi in our suspicions. Our indecision over Massa's abilities is possibly the result of our awareness that Michael would have done more with the equipment. Couple that with our dislike of drivers championships being won through car superiority alone and it may be that we approach the reality of the situation. Couldn't have put it better myself Clive. Massa is an enigma - he continues to surprise and his performances over the past 18 months have certainly caused us to reappraise Raikkonen. Perhaps even Michael now rues his decision to quit at the top of his game? Maybe even he now realises that whilst beating Raikonnen would have been a challenge at that stage in his career, it was a winnable challenge. Whatever he may have just lacked in sheer speed he would have more than made up for in fitness, determination, work ethic, guile, racecraft and experience. Is Alonso better? He was rattled by Hamilton last year - but if Hamilton is as good as I reckon he might be, that's hardly surprising. There is a cigarette paper between those two at the very top of the F1 tree and I don't think that Kubica is too far behind. As for where the Ferrari drivers fit into all of this, well, I think you are right to raise the question. One thing you and I have both said about Massa before (during his early season wobble) is that he is one tough little cookie. He is a fighter and, if he can continue to supress his inconsistency, he could yet take the biggest prize of them all. Well, as they say, it's not the size of the man in the fight, it's the size of the fight in the man. I have to say I have a soft spot for Massa - he is a hard-worker and, it seems, a genuinely nice guy. He seems to learn from every experience and gradually, continually improve. Damon Hill made the very good point when discussing the challenge of taking on Michael Schumacher that 'everyone has to put their trousers on one leg at a time in the morning' - on his day his father Graham beat the legendary Jimmy Clark, just as he, on his day, could beat and did beat Michael (Suzuka '94 leaps to mind). Massa is quite capable of taking this all the way - he just needs the luck to flow his way and to minimise his mistakes. The closer he runs him, the more chance he might stand of rattling Raikkonen's composure. I think the championship will be a straight fight between Lewis and Kimi. Felipe couldn't take a championship last year when Raikkonen didn't know the team and didn't know or like the car but by the end of the season he was ahead. I really can't figure how Massa was faster than Raikkonen at Monaco. That should be a classic Kimi circuit and he was blown away. I have said before that I think Lewis is comfortably the best driver on the grid and I am totally convinced that in ten years time we will laugh at the idea that Alonso or Raikkonen are his equal. Great post Clive - I agree with you. For my money, Alonso and Kubica are the best drivers on the grid at the moment. Massa is only 5th at best, with Raikkonen being much more of a mystery to me at the moment. Clive, before you write Kimi off, let's not forget that Lewis crashed him out in Canada and even with a damaged exhaust, he was able to keep it together enough to finish 2nd in France. I do think the Ferrari is faster at the moment. How long that will last is hard to say. Steven: I know that's how things should be, but reality keeps contradicting our theories. In searching for some way to reconcile the facts with our opinions, I stumbled upon this idea that we could be quite wrong regarding the Ferrari drivers. It is supposed to be easily the best car this year and yet does not seem to wiping the floor with the McLarens. That may be partly the result of team errors but I think we have to consider the possibility of the drivers not being all they're cracked up to be as well. Lewis is good, there's no question of that, and Kubica is proving very handy too. Alonso we know is one of the best. But is Raikkonen? And, if he's not quite as quick as we thought, that means neither is Massa. Don: I am not writing Kimi off just yet - I have given him the benefit of the doubt for a long time now and am in the habit. But it's worth taking another look occasionally and questioning our established beliefs. My suggestion that Kimi is not as good as we thought is backed up by results, even taking bad luck into account, and it very conveniently explains the Massa phenomenon. Perhaps the rest of the season will give us more answers. I think you're basically right Clive - Raikkonen just isn't as white-hot as many people thought he was when he was at McLaren, and Massa seems to be improving. That said, Raikkonen has been the more competitive Ferrari drivers of the last two races, but circumstances have conspired against him somewhat. Perhaps we shall see normal service resumed over the coming rounds. If I were Montezemolo I'd be thinking of the season of grinding, error-free consistency Fernando Alonso drove in 2006 to beat Michael Schumacher and thinking "I got to get me some of that". Perhaps Kimi drives his best when he has to fight the car more? In a weird way, maybe having the so-called best car on the grid is not working out for him. Maybe he's one of those guys who needs a challenge? Thrives on adversity? Afterall, how often do we say he looks like he went to sleep, or hear Kimi say he was bored? I am racking my brains to recall, but I am pretty sure those observations have only come since he moved to Ferrari. And as for Massa, he is much better than I expected this year, but I still can't get my head around him being possible WDC material. I don't know why, but I just can't see it. Very interesting post, Clive? Hmmm... Somehow, this COULD be right. I've always thought that had Michael stayed on in 2007 and even 2008, he could've retired with... NINE world championships. Now, of course, I think F1 is in better shape overall because Schumi retired and opened the door to more competition, but could Ferrari have been in better shape now with Schumi than without, esp. considering that Jean, Ross and Rory have moved on? There are other factors you have to take into consideration, though. The on-track mistakes made by the team have to be given more significance, and then there could be off-track politics. Remember, Kimi hates politics, but Ferrari is a naturally political team. Could that be playing a role in his waning interest in F1? As for Massa, I think it's just us being natural skeptics. Massa has been consistently peerless (and a bit lucky) since Bahrain. He's shown world-championship form. If we didn't remember his thrills-and-spills moments at Sauber, I think we'd really think of him as a likely title contender. Interesting post Clive. I've always liked Kimi and Massa. They both have good moments and bad but the good moments are so good they have always excited me. But that combination doesn't always make a world champion. In fact Kimi essentially did what he always does last year. In the normal state of play that would have meant he was second or third like normal. He won, to a certain extent, because of the fighting between the McLaren boys. I'd like to throw another reappraisal into the mix. Perhaps Heikki isn't underperforming this year. Perhaps the McLaren is that much slower than the Ferrari? And Lewis is driving his socks off? While Hamilton is beaten by two drivers, this is natural because Kubica and Massa have similarly aggressive driving styles and therefore thrive in the same situations (at the moment this is less obvious because Ferrari and BMW like different circuits). The other thing to say is that apart from Raikkonen and Alonso, all the others are flexible enough to change and therefore improve their driving styles on a long-term basis - Hamilton and Kubica by instinct born of inexperience and Massa because he knows he's in the position he's in now because of spending 2003 learning at Ferrari's feet (and values improvement accordingly). So if Ferrari's drivers are not as superior as the car, it is because those who would be as superior as the car are not currently in F1 (yes Michael Schumacher, I mean you). It makes for very close racing, which can't be a bad thing. I agree with you Alianora - the top drivers are now exceptionally close, perhaps more than at any time since the mid- to late-'80s (Piquet, Prost, Senna, Mansell, Rosberg). I also think your reference to Schumacher is dead on - Michael's completeness as a driver and a team leader only becomes more apparent in his absence. Keith - if I were Montezemelo I'd be thinking the same thing, but I'd also know that the only way that would work would be to give Alonso absolute number one status, such as he enjoyed at Renault and Michael enjoyed at Ferrari. Nothing rattles Fernando's cage more - and exposes him to pressure errors - than someone in the same equipment who poses a competitive threat! Now considernig we are debating on certain assumptions. I am inclined to string together certain things...1. Massa isn't as bad as everyone thought, in fact he's pretty good 2. Ferrari'06 <> Ferrari'07/'08, neither the car nor the team has been any close to what they were in Schumi era. (When did we see Schumi stop on track without fuel??) So why are we expecting the current Team Ferrari to demostrate the spotless performance of the previous era which was run by totally different set of people? I think Journeyer has said it best, I agree Ferrari TEAM and equipment errors have hurt Massa more than anything Massa himself has done wrong. They hurt Kimi also to a lesser degree. This is not the Ferrari TEAM of the Schmacher era. McLaren's car seems to be up to the task but Hamilton is proving to still be a rookie and Kovalainen has had more bad luck than I can remember in a long time. Kubica is probably the "star" this season, on par with the best, if BMW could just find a couple more 1/10ths. I respect Massa because he came in and did as thye asked him to do, just be Micheal's #2. Which is contrary to what a driver does, which is try to be the best at all times. He never complained, and by the end of the year, he was winning for Ferrari. Last year, everyone expected Kimi (myself included) to blow Felipe away and that really never happened. This year, he had a disastrous start to the season and still came back into the picture by keeping a cool head and just doing his job. To me, it is Hamilton who is highly over-rated. He would be struggling in a Toyota, Toro Roso, or Force India. Interesting thoughts, all. What surprises me is how few have argued that Kimi is as good as we thought before he joined Ferrari. I was expecting more diehard indignation, I guess! Agreed that the Ferrari team has not been the efficient machine it was in Michael's time, but was not that part of what made him a supreme driver? Perhaps we were all expecting a little too much of Kimi in being able to focus a team as Michael could. But Massa is obviously as good as the Finn - he proved that in Monaco this year. It all makes for better racing, however, with no driver in a position to dominate and we get another brilliant season as a result. It may just be that Kimi is one of those drivers in the Hunt or Scheckter mould whose whole life is geared to winning the world championship and once that has been achieved the motivation that has driven them evaporates. Scheckter on retiring at the end of 1980 said that once he won the 79 title he had achieved everything he set out to do. Hunt I think was similar although I think fear drove him to retirement. He was clearly spooked by Ronnie Peterson's death and whereas before he had the ambition to drive him through things like that when the ambition was gone the fear took over. What impresses me the most on Massa's behalf is his ability to learn. He has not the same natural talent of Hamilton, Kubica, Raikkonen or Alonso. I even think that Barrichello is more 'naturally talented' than him. But every season Massa improves a lot. He learns from every mistake he commits. One of his biggest problems was his lack of consistency. And now what I see is a consistent driver, who knows that sometimes he has to win the race, and when it is not his day, he has to do the best and gather as many points as possible - see Monaco and Canada. In Magny Cours, he was safely going for the 2nd spot, in a day he was not supposed to win. His declarations after the race at Magny Cours also impressed me. He said that Kimi deserved to win, and Kimi would win if he hadn't that exhaust problem. When asked about the great brazilian champions and how he would compare to them (it's the first time a brazilian leads the championship since 1993), he said he is only a tiny little guy compared to Senna, Piquet or Fittipaldi. To me, these are the types of declarations from a guy that deserves to win a championship, who is focused in winning it and that knows what to do to win it. I always referred to Massa as the Rodney Dangerfield of F1 ...as in "...I can't get no respect..."
That's a very good point about Massa's ability to learn, Felipe, and one we easily forget. I think we tend to remember his days with Sauber and assume that he remains that driver, whereas the reality is that he has grown tremendously since then. Kimi did a great job of pulling is season together last year, but I really think he won the championship because McLaren and their drivers let him. They dropped the ball and he picked it up.